I’m susceptible to most holidays but if there was a Valentine’s Day Scrooge, I’d completely support his life choices. Moreover, if the Grinch stole hearts instead of toys, I could really get behind him. Forced gaiety I can handle but forced hearts and flowers can be pretty tough to take (plus you might get caught). Maybe it’s that my own birthday falls a week before (a personal new year’s eve with the requisite highs and lows) or the wear down of a freezing winter, but I felt little need to acknowledge the day and was resisting all cheerful attempts to make a plan, make a reservation, make something happen. Fortunately, the only boy on my mind was turning one so I was too wrapped up in making him an animal cracker cheesecake to worry about it. I’d given him his first bottle and was thrilled when his mom asked if I’d make his first birthday cake. 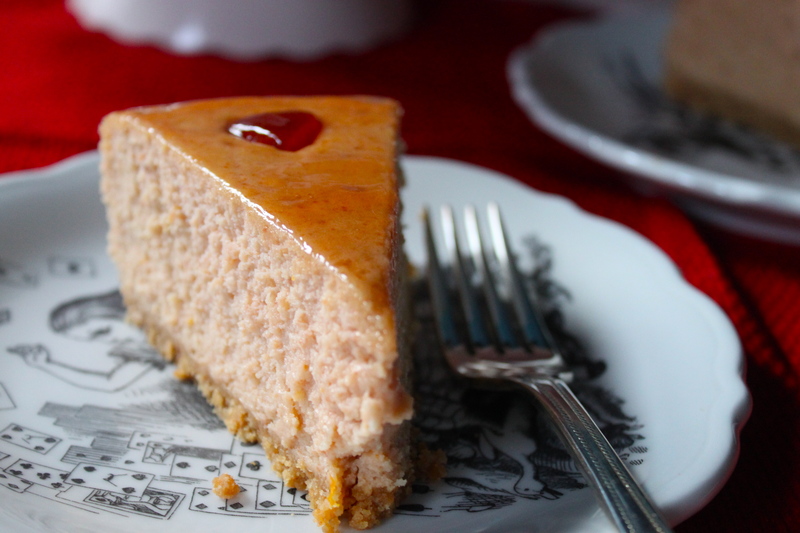 Some time between the cake chilling and icing monkey and elephant cookies, I started thinking about a different kind of cheesecake, one with guava, orange zest and maybe a little rum, a way to acknowledge the day that must not be named. If I was going to give in and create a Valentine’s Day post, I wanted reflect my own ambivalence and said it with playing cards. This cake would have hearts of course but clubs, spades and diamonds too. After all, is love a question of fate, written in the stars, a direct hit from a bratty cherub or just the luck of the draw? I considered using fresh guavas but they can be hard to find in New York. Worried that guava paste would be too heavy, I used it for decoration instead. Fortunately, I had a couple of cans of poached guava shells left that were just right, sweet but not cloying. Rich, decadent, and French-sky pink, it helped me believe there are worse things than having a day set apart to celebrate obscure Roman saints, love and friendship. Of course, in many Latin American countries Saint Valentine’s Day goes by el día de los enamorados. “Los enamorados” referring to couples in love – happy, content, and ready to celebrate Hallmark holidays on any given weekday – or just the people who love – the enamored. I may be biased but I prefer the latter interpretation. Everyone warns against being the one who loves too much so I’d rather think that the holiday celebrates them instead since more often than not the deck is stacked against them. Feliz día de los enamorados. Preheat the oven to 350 degrees. Lightly grease a springform pan and set aside. In a large mixing bowl, combine the cracker crumbs and melted butter until the mixture holds together. Fill the prepared pan with the crumb mixture and press into the bottom of the pan to form the crust. If necessary, use a measuring cup to level the bottom. Bake 9-10 minutes until lightly browned. Remove from oven and set aside to cool completely. Tightly wrap the bottom of the pan in aluminum foil and set aside. Combine the guava shells, rum, orange juice, zest and salt in a food processor or blender and puree until smooth. Set aside. In an electric mixer fitted with a paddle attachment, beat the cream cheese on medium speed till smooth about one minute. Slowly add the sugar and continue to beat on medium high until light and fluffy, about 5 additional minutes. Reduce speed and blend in guava-orange mixture and flour. Add the eggs one at a time, blending well after each additional and periodically scraping down the sides of the bowl until combined. Pour the filling into the prepared pan. To prepare the baño de María, place the pan in a larger baking pan. Pour enough hot water into the pan so that it comes about halfway up the sides of the mold. Carefully place both pans in the oven and bake for one hour and 15 minutes. Turn off the oven and cool in the oven for an additional hour. Remove from oven and chill for at least four hours or overnight. Cut guava paste in 1/4″ thick slices. Using small aspic cutter, punch out small forms in desired shapes from guava paste as additional decoration. Press into the surface of the cheesecake. Heat guava jelly over medium heat until melted, about 3-5 minutes. Lightly brush top of the cake with glaze. Hey, if you don’t have a stand mixer, just adding stuff slowly works too right? Using beater? I’m sure an electric beater would work just as well. If the ingredients are at room temperature they should blend together easily. 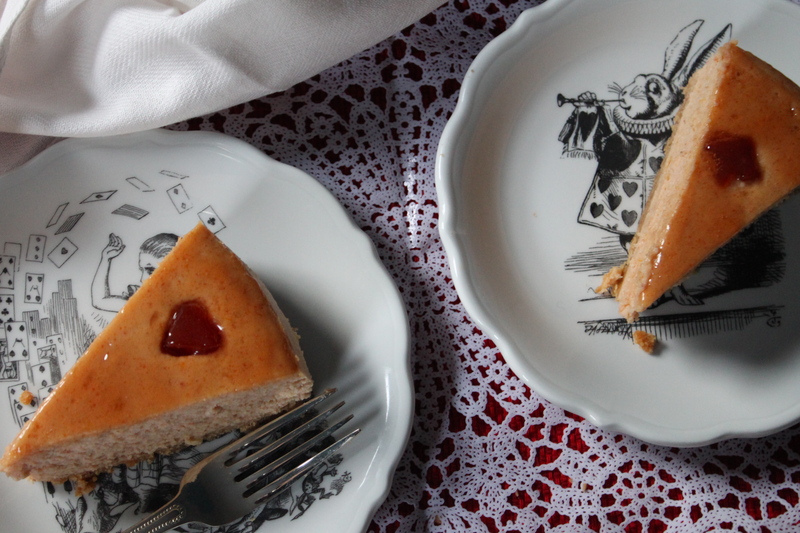 If you’re skittish about baking cheesecake is a good place to start. I gasped when I saw the title. Divine. If only we could get tastings over the computer. Thanks for teaching me so much about cuisines I knew little or nothing about…. Beautiful! I really enjoyed this entry and look forward to whipping up this amazing recipe in my own kitchen. Thank you!!! Where do you find all the guava products? This does not look horribly complicated (and I don’t cook). I am very tempted to try. You can find guava paste in the Goya section of most grocery stores and sometime guava jelly as well. The poached guava shells can be harder to find but they usually sell them in Latin American grocery stores or bodegas. Good luck! I’m so glad I found you~! Used to live in South Florida and REALLY miss the delicous cuban food~! Can’t find it up north~! So can you used the Guava paste instead of the poached guava shells?? If so how much would I use of the paste? This sounds delish!! I used to live in Puerto Rico and fell in love with guavas!!! Thanks for posting!! I do have fresh guava here-how do I prepare it to avoid canned shells that I can’t find? Place guava halves in a medium bowl and set aside. In a medium saucepan, combine water, sugar, cinnamon stick, and orange peels. Bring mixture to a boil, stirring to dissolve the sugar. Allow mixture to reduce to about 3/4 cup. Add guava halves and cook just until heated through. Remove mixture from the heat and cool. Remove cinnamon stick and orange peels before serving. I think I’ll try myself if I can find the guavas fresh! Hi… I was wondiering what size of pan do i need to bake this cake? Thank you for catching that! I used a 9-inch springform pan. 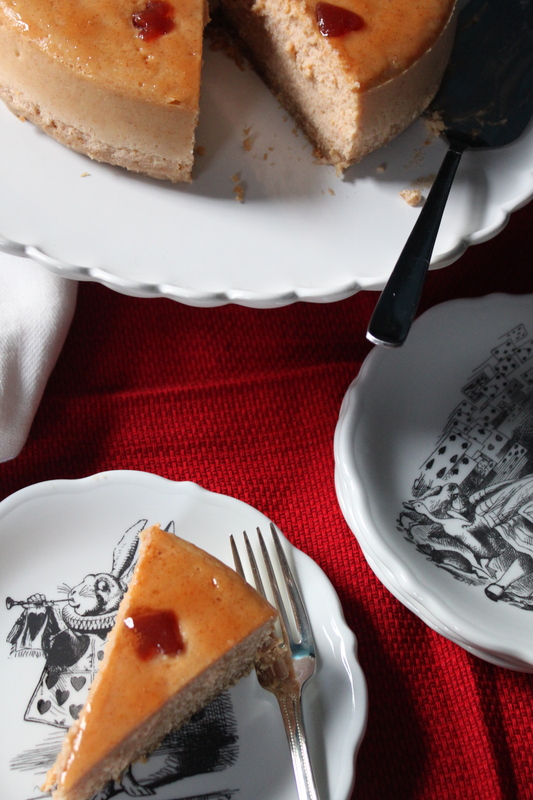 Where do I find those lovely Alice in Wonderland plates!? 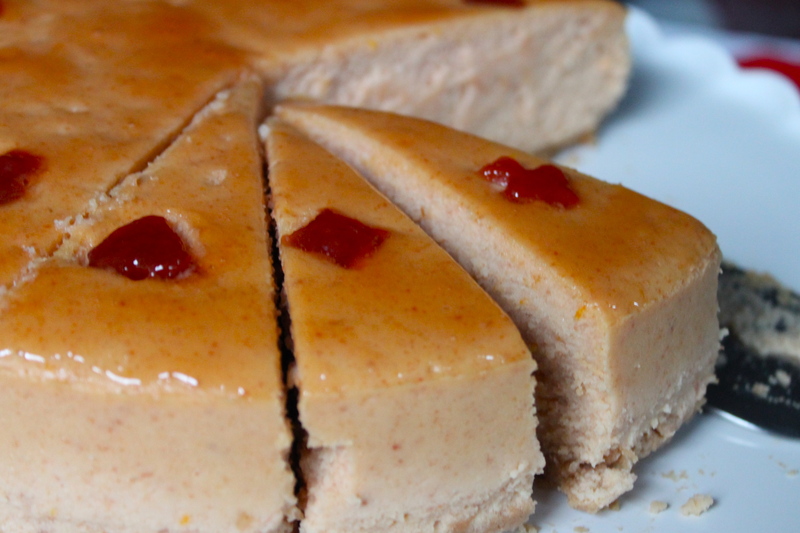 It’s been a while that I have been trying to find a good guava cheesecake recipe and I can’t wait to try this one. Thank you for sharing it! 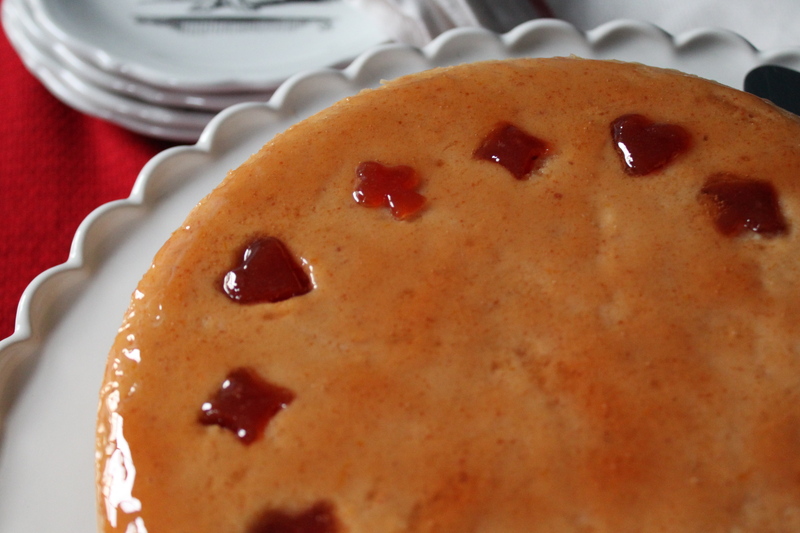 I made this cheesecake with jarred guava marmalade and don’t recommend using marmalade. The cheesecake was entirely too dense and pasty. When I took the first bite the weight of it made my mouth want to remain motionless then as I began to chew it was so pasty the roof of my mouth along with my tongue were equally coated at once and only a strong gulp of room temp coffee washed it down quickly. I don’t reccomend using the jarred marmalade. I’ll try the shells next time like this recipe calls for. F.Y.I. I switch mascarpone for ALL philly sometimes because mascarpone has less of a bite and is much smoother on the palette. Another F.Y.I. the glass bottom springform I find works better with any cheesecake because it allows for an easier transition to the dessert plate as opposed to the teflon bottom which has the elevated ridge and is easily scratched when slicing the pieces. I bake a lot obviously. Enjoy and as always lovely writing. OMG I Love that you use Maria cookies for your cheesecake crust!!!! Ive been doing that for years!!!! I make my key lime pie crust out of Maria cookies!!!! We are having a Cuban Mother’s Day lunch containing Arroz Morros, yucca, pierna & ensalada de pollo. I thought this would be a perfect dessert! It’s already in the oven, but in the recipe it never stated when to add the rum & salt to the mixture, so it was the last thing added. Can’t wait to try it! Thanks for this recipe! Thanks for catching that and please let me know how it turns out! Happy Mother’s Day!